Sea Creature House Number Sign - - arch shape wall-mount address plaque with a fish or other sea creature floating within the arch. Perfect for use at a beach house, seaside condo, waterfront property, and fish- or water-related business. Made in USA. 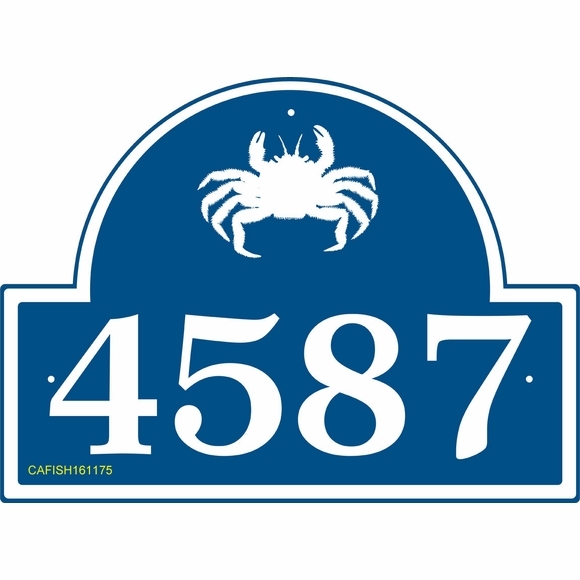 Arch shape address sign personalized with your house number as well as the sea creature image you select. Fourteen creatures: flounder, sailfish, swordfish, whale, dolphin, shark, starfish, octopus, lobster, sea urchin, crab, seahorse, angelfish, and tuna. Two sizes: 12"W x 9"H and 16"W x 11.75"H.
If you need more than four numbers (or want 4" or 5" numbers), be sure to pick the 16" x 11.75" size sign. Comfort House P2262. Sea Creature House Number Sign perfect for use at a beach house, seaside condo, waterfront property, and fish- or water-related business. Made in USA.